What is an ONPUL Sealer? What is an Impulse Sealer? 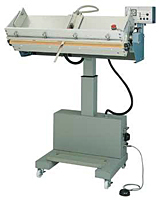 The FIL-NTG series impulse sealer is great for large-size packaging. This gas flushing machine offers not only the gas flush, but also a vacuum pump to prevent oxidation and deterioration. This style of packaging machinery seals securely with our state-of-the-art sequence control system. The sealer head moves upward and downward by electro motion, adopting a screw jack system. The gas flushing FIL-NTG’s sealer head tilt angle can be adjusted between 0 and 90 degrees. The vacuum nozzle is arranged in the center of the machine. A tension arm is an available option to create a smooth wrinkle on each pouch. Copyright © 2008-2016 Fuji Impulse, Co. Ltd. All rights reserved.